Renewable energies are often regarded as a silver bullet to abundant social and ecological problems, amongst them the rising energy-hunger and the challenges of anthropogenic climate change. However, the transition towards renewable energies is paved with conflict – be they discursive contestation, resource competition (including access to land), or concerning policy aims and trade-offs. For instance, despite the consensus on the need to transition from fossil fuels to renewable energies, opposition often arises as soon as renewable energy plants are constructed in the vicinity. Transparent communication, compensation, and effective participation may foster acceptance in those cases. 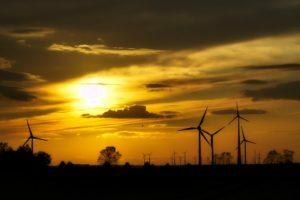 But conflicts may not be precluded completely through these highly ambitious and important tools, as open questions remain (both normative and empirical), relating to the generation, distribution, and efficiency of renewable energy. More specific examples for conflictive issues that arise during energy transitions are the (de)centralization of energy systems, the processes of extracting those materials necessary to build renewable energy facilities, and conflicting policy goals (e.g. biodiversity conservation vs. mitigation, precaution vs. nuclear energy, or material/energy supply through imports vs. national self-sufficiency). These social, political, economic, and ecological implications of changing energy systems were addressed by young scholars from all over Germany who came together at the Political Science Institute of the Technische Universität Darmstadt from July 13-15, 2017. The interdisciplinary event that brought together perspectives from political science, sociology, economics, geography, and law was part of the consecutive workshop series of the Working Group “Nature, Resources and Conflict” of the German Association for Peace and Conflict Studies (AFK), and also featured as a special session of the Institute’s Research Group “Energy – Climate – Environment”. The workshop showed that substantial transitions of energy systems are not the task of isolated political actors. Rather various institutions and discourses are relevant for this development. Thus, policy planning and implementation evolve across local, national, and regional levels, but national legislation, still, remains a crucial instance of policy design. Reviewing developments in 94 countries, Heike Böhler and Kai Schulze (both TU Darmstadt) found that controversial issues were avoided ahead of democratic elections at the national level. Yet, a more detailed specification concerning the relation between electoral incentives and controversy around different types of policies required further research. Relatedly, Konrad Gürtler and Rafael Postpischil (both Freie Universität Berlin) showed in their analysis of energy transition politics in Spain and the Czech Republic that lobbying activities can lead to lowering or eliminating feed-in tariffs if policies are designed inadequately. Still, as highlighted by Iris Behr (Institute for Housing and Environment, IWU), a substantial energy transition needs to go beyond technological adjustments of the grid system. Rather, as part of a broader mainstreaming approach, substantial energy transitions needed to include mobility management, energy efficiency and infrastructure (e.g. Mieterstrom) in local quarters. Conditions that favor such kind of sustainability transformations include the display of its necessity and potentials, market and employment opportunities, and learning by example (e.g. in the European Union). However, the initiation of policy initiatives and the proliferation of innovation hinge, not least, on the support of powerful discourse coalitions in a specific socio-technical field (such as the energy sector), as illustrated by Mario Neukirch (University of Stuttgart). In concomitant struggles, oftentimes different – and possibly conflicting – principles guide the politics of energy transitions, such as ‘sustainability’, ‘security’, and ‘competitiveness.’ This was shown by Michèle Knodt (TU Darmstadt and Kopernikus Initiative) with view to developments at the European level. The opening and closure of public debate were analyzed for the case of biofuels within the bioeconomy framework (Thomas Vogelpohl, FernUniversität Hagen), for the controversy on state-market relations and social change (Benedikt Franz, TU Darmstadt), and for the barriers and lock-ins of the energy transition in Germany (Pia Buschmann, University of Münster and Angela Oels, Open Universiteit Nederland). One of these barriers are claims for increased participation in the context of specific energy transition projects. Here, interestingly, a strong link exists between populist movements and opposition to the Energiewende (Eva Eichenauer, PIK Potsdam). The workshop was one of three parallel events at the Technische Universität Darmstadt which addressed the prospects, challenges, and potentials of energy transitions from different disciplinary perspectives. The two complementary events were facilitated by the Technische Universität Darmstadt in collaboration with the Fraunhofer Institute’s Project Group Materials Recycling and Resource Strategies, and by the interdisciplinary Graduate School “Critical Infrastructures” KRITIS (TU Darmstadt), respectively. The former event was organized as a symposium with the title “The Great Transition: the importance of critical metals for green energy technologies” and brought together approx. 150 scholars to discuss material requirements of various energy technologies as well as the potentials of these materials for recycling and substitution. A key point from the Symposium was that both the extraction as well as the transport of natural resources required to produce batteries, magnets, and conducting materials were crucial from a technological perspective. Thus, a comprehensive energy transition should be conceptualized as a material transition. At the same time, the extraction of resources for renewable energy technologies was too often framed as a mainly technological issue, leaving a blind spot on the social and ecological aspects of these activities (e.g. ‘conflict minerals’). The KRITIS event addressed some of those gaps and introduced the concept ‘criticality’ to emphasize the political, social, and material dimensions as they relate to energy generation, energy storage, and transport and use. Complementarily, the workshop participants concluded that the discourse on energy transitions tends to have a bias towards the generation and distribution of electricity, sidelining other relevant dimensions such as gentrification, thermal insulation, conflict, mobility, and lifestyle. Furthermore, it was asserted that more effort could be dedicated to studying single cases, but also to comparative studies with a geographical focus on the so-called Global South and to the further development of theoretical and conceptual considerations pertinent to the field. The workshop was partly supported by the research project “GreeTS: Green Transformations in the Global South”. For further information please send an email to wallbott@pg.tu-darmstadt.de or kreuter@pg.tu-darmstadt.de. Linda Wallbott is a political science (international relations) researcher and coordinator of the interdisciplinary and international research project “GreeTS: Green Transformations in the Global South – opening the blackbox of a pro-active state and the management of sustainability trade-offs in Costa Rica and Vietnam”. Her research focuses on global environmental governance and international negotiations. Judith Kreuter is research and teaching fellow at the chair for international relations at Darmstadt University. Her research focuses on technological innovation in climate governance and the science-policy nexus. She teaches courses on political science, international relations, environmental and climate policy as well as technology governance. How can the reorganization of traditional supply chain networks/trade policies be facilitated to protect and develop the integrity of ‘green electron’ technology as a national security tool in the public eye?